Two of the best master limited partnerships go head to head to win investors' hearts -- and portfolios. Believe it or not, there were some American energy stocks that performed quite well before the oil and gas boom started. Magellan Midstream Partners (NYSE:MMP) and Enterprise Products Partners (NYSE:EPD) have been rewarding investors for over a decade with their distributions and unit price appreciation. Shedding their general partners in 2009 and 2010, respectively, they are two of the very few master limited partnerships that don't pay incentive distribution rights to a general partner. They're reliable winners, only question is, which one should you buy? Based on distribution growth, which in turn drives unit price appreciation, Magellan has really outperformed Enterprise over the last 10 years. But before we crown a victor based solely on this one factor, let's dig a little deeper. 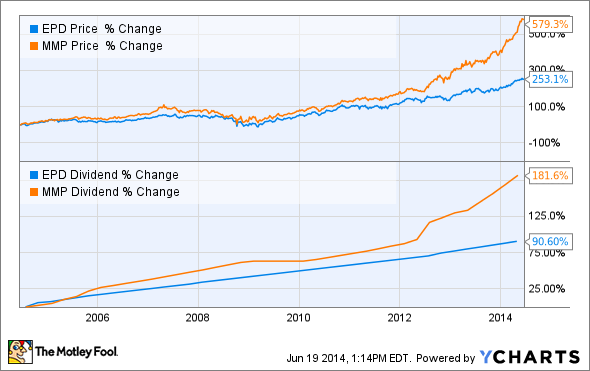 Let's take a look at these two MLPs head-to-head on a few key metrics. We'll use price-to-distributable cash flow, distribution coverage ratio, consecutive quarterly distribution increases, percentage of debt owed in the next five years, and credit ratings to guide us. Source: SEC filings, MLPData.com, company releases . Debt figure is as of Q1, 2014. Moving left to right across this table beginning with our price to distributable cash flow metric, Enterprise Products Partners has a slight edge -- though neither of these MLPs look particularly cheap right now. Distribution coverage is a wash, as both of these partnerships have plenty of breathing room for increases. These distributions are safe. The "consecutive quarterly distribution increases" column raises an interesting point. Magellan froze its distribution for an entire year beginning in May of 2009; Enterprise did not, proving when the chips are down, this MLP continues to pay up. However, given what we've seen out of Magellan's distribution growth over the last 10 years, some investors may not care about that at all. Moving on to the debt figure. Typically the further out the debt matures, the better, especially given how the energy industry is spending cash right now to build much-needed infrastructure. Theoretically, these new projects will be up and running -- and generating cash -- before their bills come due. Enterprise handles its debt in remarkable fashion, extending maturities while also significantly driving down the average cost of its debt over the last three years. Magellan actually has a small debt load relative to the EBITDA it generates every year, so although it is debt-heavy in the near term, it is not necessarily the deal-breaker it looks like here. And finally, both of these MLPs have the very highest possible credit rating Standard & Poor's is willing to issue a master limited partnership. When interest rates rise, both MLPs with have an advantage over their peers when it comes to securing capital for growth. Naturally, we need to look forward to see what these two partnerships can offer investors by way of future distribution growth before we make a buy decision. Enterprise is much bigger than Magellan, so in order for it to move the needle it has to shell out much more cash than its smaller peer. Purchasing either one of these MLPs is going to depend on the unique needs of an individual portfolio. If you are looking for a time-tested, conservative, extremely reliable MLP you might be willing to forgo massive distribution increases and choose Enterprise. If you really need that distribution growth, you might choose the smaller Magellan Midstream Partners. Or, you may identify the best traits of each and go out and identify your own winner, leaving both of these MLPs on the sidelines.